At the most basic level, you need to get all documents in a standard electronic format. Many organizations are still using binders to keep paper copies of policies and procedures and don’t always have an electronic version to work with when they need to make changes. Start out by identifying electronic copies of all policies and having them typed up from the paper copies when needed. Next determine what word processor your organization wants to use and ensure all policies are in that format. I would recommend Microsoft Word since most people are familiar with the product and it allows editing when needed. Other things to consider are templates for your policies and procedures and naming conventions. Once you have put together the standards be sure to document and share this information with those responsible for writing and approving. This will ensure that everyone is on the same page and understands the expectations for publishing policies and procedures. Policies and procedures need to be made readily accessible to the staff. There are many considerations here but the first should be where will the documents reside? Traditionally this has been in binders or on shared network drives. My experience is that the best location for your policies and procedures is your intranet or other web based document management system. A good intranet will also provide searchability and keyword tagging making it even easier for staff locate the policies and procedures they need. You will want to put thought into how the documents are organized and published. 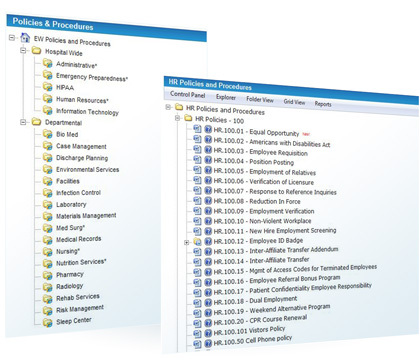 Creating folders for organization will make it easier for staff to browse and locate the documents they need. Always look at things from the staff perspective when deciding which folder the document should reside in. If you decide a document needs to be in more than one folder, place a single copy in one location and link to the existing page or document directly. Uploading multiple versions of the same document in different places will lead to big problems when that document gets updated as it is impossible to keep track of all the different locations. Having only instance of each document will make sure your staff is accessing and using the correct version at all times. Identifying document ownership is critical to ensuring policies and procedures and kept up to date. Each document should have an author and approver as well as a moderator with oversight to the policies and procedures review and update process. Be sure your authors are following the standards put in place for review by assigning review dates to policies. Make sure your moderators have a process for ensuring the authors are keeping documents up to date. This could be as basic as a spreadsheet of documents and dates or a fully automated policies and procedures management system. Lastly, have a plan in place for turnover as document ownership can change frequently as staff come and go or move around within the organization. Following these best practices can help you to achieve success in managing your policies and procedures. If you would like to learn more, click here to see our library of recorded webinars covering this and other important topics.